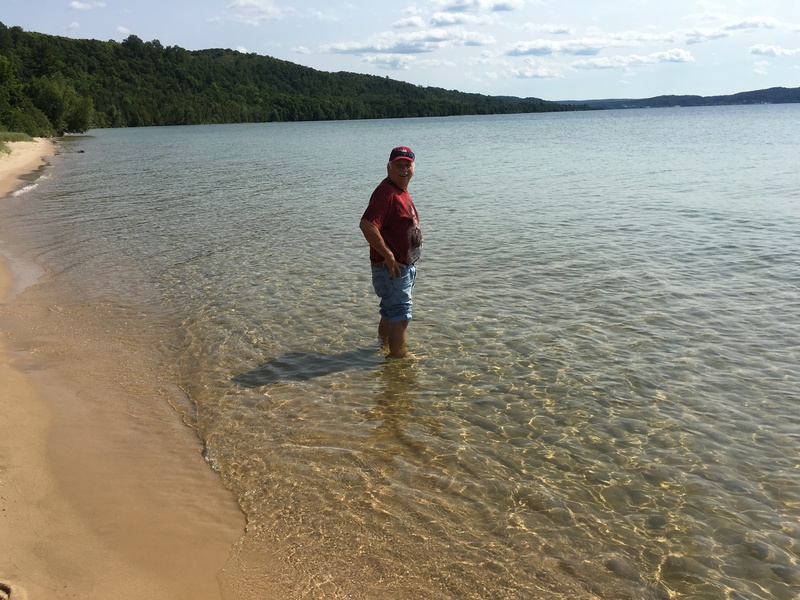 Pictured Rocks – Let's Go RVing! What a day in Munising, Michigan. 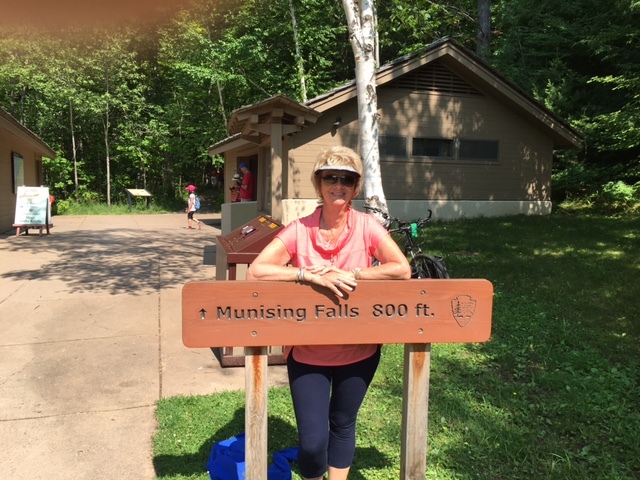 Although we stayed in Marquette our plan for today was to visit Munising and get in as much as possible. We left about 10:00 and when we got to Munising we went directly to the Visitor’s Center. 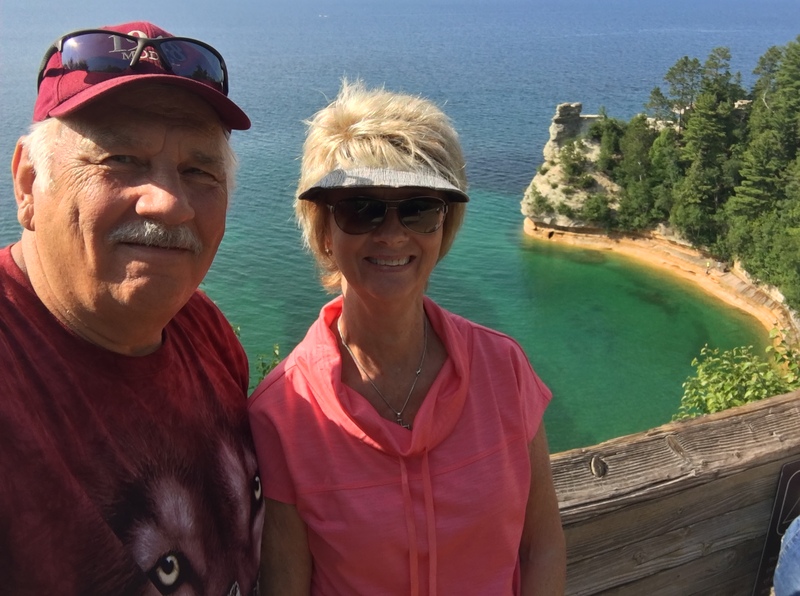 The lady that helped us gave us a map and showed us some interesting places to visit but then asked if we were planning to take the Pictured Rocks cruise. When we answered yes she suggested that we get out tickets first and then plan our day around our cruise time. We left the Visitor’s Center and went directly to Pictured Rocks Cruises and bought tickets for the 1:00 ride. I thought they were a bit pricey at $38 a piece but when I found out later that the cruise was 2 ½ hours that made the price more reasonable. We had about an hour before boarding so we decided to eat lunch. There was a restaurant within walking distance so we went over there. Jerry got a whitefish sandwich and I got a BLT. Both were OK but nothing to write home about. We boarded along with enough people to make it a full boat and pulled out of the dock right on time. The captain was very good, gave good information and threw in a little humor along the way. We were able to sit up top so the view was perfect. The Pictured Rocks National Park is located on Lake Superior. 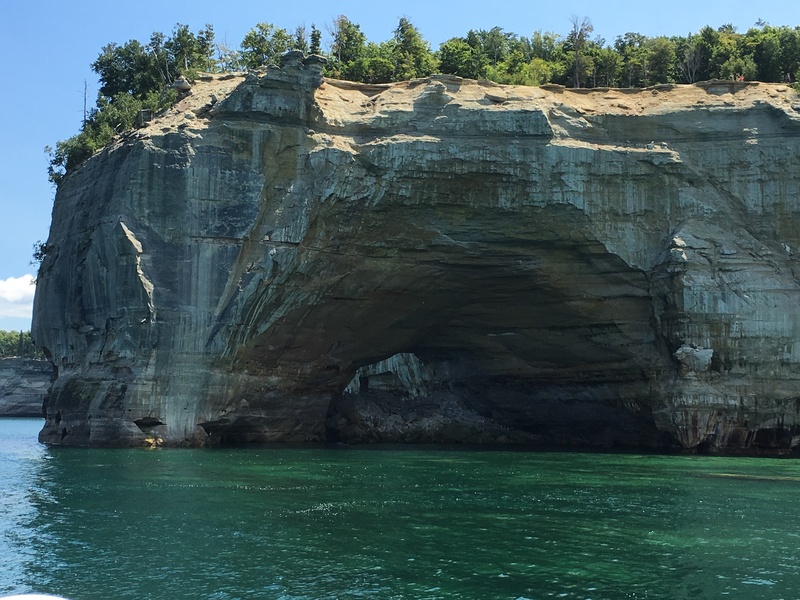 According to the National Park Service the name “pictured rocks” comes from the streaks of mineral stain that decorate the face of the cliffs. They are truly indescribable, like nothing I’ve ever seen before, so massive and so colorful. Since we were viewing from the water we got close ups of Miners Castle, the Arch and Chapel Cove. In fact, the captain took the boat right into Chapel Cove where we were really close to the formations. Very easily he backed it out and we continued our tour ending at a waterfall cascading into the lake. The ride back was equally as interesting to me since I was on the left side of the boat. Pictures I took on the way out had the loud speaker and the lines of the mast in them, never a clear shot. That’s all right – Jerry took enough for both of us. Our next stop was Sand Point, a nice sandy beach area where there were a number of people taking advantage of the water. Jerry wanted to stick his toes in Lake Superior so he rolled up his jeans and took his shoes off. Had he had a bathing suit on I’m sure he would have gone swimming. From where I was standing it looked like the sand had ridge formations making it difficult to walk steadily. It would have been a good story but Jerry didn’t fall. Our next stop was Miners Castle. We had seen this from the water but wanted to see it up close. As we were standing on the outlook a tour boat passed by and we waved to them just as others had waved to us earlier when we passed. The view of Lake Superior is again spectacular – it just goes on and on! Although we so wanted to ride our bikes this evening we wisely decided that we were just too tired. In anticipation of a late day off touring we had planned to bake two of the pasties that we had gotten in Traverse City at Cousin Jenny’s. I put them in the toaster oven and fixed a salad and we had a very nice dinner. Jerry doctored his with cayenne pepper and I just used the Dynamite Sauce that I had bought from them when I got the pasties.